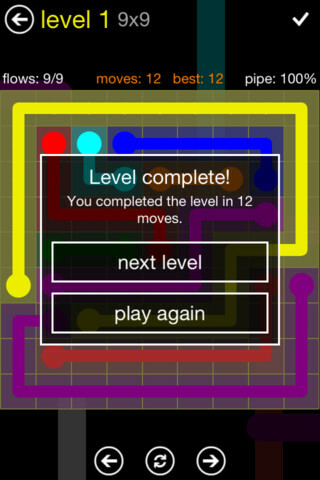 Developer Quote: "Flow Free is a simple yet addictive puzzle game. Connect matching colors with pipe to create a flow. " 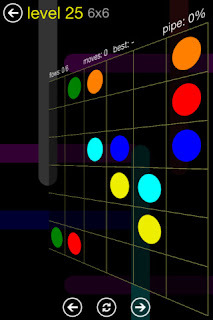 Your Flow Free board is a grid containing pairs of bright and colorful dots. Try to connect the pairs of dots by matching two of a like color. Don't be fooled into thinking this is a piece of cake. Yes, your game will start out easy with 5 x 5 grids, but it then increases with grids of 6 x 6, 7 x 7 and so on up. (Didn't I say you needed to have your neurons fired up?) Anyway, since you'll probably get hooked on this addicting game, you should know you can make in app purchases for additional packs. Also, upgrading will remove the ads. Beautiful and vibrant colors that literally flow through line segments on your display make this game appealing to all. Puzzles are a great way to pass time if you have some spare moments, and also to keep kids busy on road trips. COOL CONCLUSION: A colorful and challenging new take on puzzlers is here in the form of Flow Free, a game of connecting colorful dots in a strategic way while avoiding "flow" obstacles!